Click here to return to the library. Amplifier Clipping: How Do I Avoid It? Clipping is distortion in the signal from the amplifier to the speaker that is caused when one or more of the waveforms that represent the many instruments and voices in a music signal are driven at levels to the speakers beyond maximum amplifier levels. Generally speaking, the amplifier gain is not properly set or the volume is too high. The most common, and avoidable, form of amplifier clipping occurs when an audio amplifier is driven beyond its ability to generate sufficient voltage or current to reproduce the original signal to your speakers. The generated up and down voltage swing is limited at some maximum values in either direction and the resulting sound reaching the speakers is distorted. Electric guitar players may overdrive guitar amplifiers intentionally to get a different sound, but clipping from your music amplifier changes the original material into something that just doesn’t sound good. 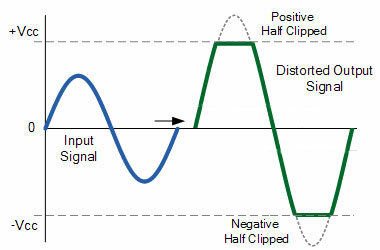 Short-term clipping is a result of insufficient peak power available. Some instruments and sounds take more energy to reproduce than others, they create a more dynamic waveform if viewed on an oscilloscope. Additionally, the volume at which an instrument is played relative to the other sound volumes in the passage can add to the energy requirement. A cymbal crash is a good example of a dynamic sound wave. Its voltage waveform may rise well above the rest of the music’s waveform voltage peaks. If your amplifier has the peak power available, it will reproduce this cymbal sound accurately. If the amplifier peak power maxes out below the signal’s max voltage, then clipping results. Or, if the peak power is not generated fast enough, the signal may be distorted or clipped as well. Long term clipping is a result of inadequate RMS or continuous power available for the volume setting. This condition may result due to an inadequate power match between the amplifier and the speakers and desired volume levels. Long-term clipping can result from extended amplifier play over several hours as well. Inadequate cooling in the amplifier may further limit the power available. Subwoofers can overheat if not chosen properly, clipping the sound in a similar distorted manner when they fail to completely follow the original waveform even if the amplifier signal is accurate. Be aware that additional energy is pushed through the speakers in this condition that generates more heat than correctly formed signals. Because of this problem, clipping may damage speakers due to overheating. The solution to short and long term amplifier clipping due to insufficient power available to reach the desired volume level is to choose speakers that can reproduce the volumes desired (SPL) and then match the amplifier power needed to drive this speaker system. The amp should have sufficient excess power to reproduce short-term peak voltage spikes as well as providing the continuous power needed to avoid nearing its maximum RMS power rating. Higher quality amplifiers are built to provide peak power extremely fast to ensure accurate playback. If you are experiencing clipping distortion with your current amp, you may need to buy a larger power amplifier or live with lower volume levels. But be sure the amplifier gain is properly adjusted before rushing to buy another amp. Proper gain setting is important to avoid clipping. By properly selecting a system designed to work together with ample power to reproduce music at your desired listening volume without clipping, you ensure the cymbals and all other instruments are reproduced faithfully to the original production with a minimum of distortion and sound pleasing to the ear. Why You Need Higher Quality Audio Wiring?